Diadophis punctatus, the ring-necked snake, is found throughout North America. Coloration varies, depending on the subspecies. The dorsum is dark gray, blue gray, light brown, olive green or dark green. The ring-necked snake’s belly is yellow, orange or red. A band of color matching the snake’s belly circles its neck. Of the 13 identified subspecies, seven are native to California, and all are varying shades of green with bright red or orange bellies. Many of the subspecies of the ring-necked snakes native to California have common names that describe their locations. Pacific ring-necked snakes are found in Sonoma County, north of Monterey Bay. Monterey ring-necked snakes, San Diego ring-necked snakes and San Bernadino ring-necked snakes all populate the areas for which they are named. Northwestern ring-necked snakes live in northwestern California, from Sonoma County north into Oregon and Washington. Coral-bellied ring-necked snakes are found throughout California. Regal ring-necked snakes live along several California mountain ranges. Ring-necked snakes prefer dark, moist places and like to hide under rocks, bark, leaves or woodpiles. They are nocturnal, so many aspects of their behavior is unknown. 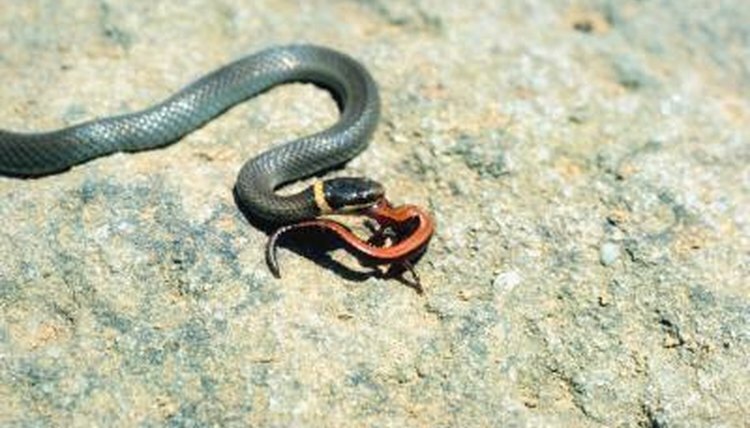 Only six confirmed sightings of ring-necked snakes mating have been recorded. The species is social and lives in large colonies with as many as 100 individuals, but ring-necked snakes don’t care for the 3 to 10 eggs they lay, or the offspring that hatch in September. Ring-necked snakes communicate by rubbing their heads on each other and releasing pheromones. Though they’re non-aggressive and not considered poisonous to humans, ring-necked snakes do have a mild venom. The venom incapacitates the salamanders, frogs, lizards, worms, slugs and other small snake species that ring-necked snakes eat. After injecting their prey with venom, the snakes constrict it while swallowing it whole. Other species of snakes hunt and eat ring-necked snakes, including coral snakes, kingsnakes and various species of racers. In turns, animals such as wild boars, owls, shrews, opossums, armadillos and skunks eat ring-necked snakes. When threatened, these snakes coil their tails into a corkscrew shape and raise them into the air. The reddish color on the underside of the tail is a warning decoy. If that doesn’t work, the species sometimes plays dead or releases a musk to deter predators.